Visit Our Jeep, Ram, Dodge and Chrysler Dealer near Utica! Only A Short Drive From Utica! When you need a new or new-to-you car, don't just look to the closest dealership. Make the drive to our Chrysler, Dodge, Ram and Jeep dealership near Utica, NY! We have a massive inventory of new and used vehicles for you to choose from, plus we have an expert service staff that can help you ensure your vehicle is running smoothly for years to come. When it comes time to decide where to buy a car, think huge and think Fuccillo! Make the short drive from Utica, NY, to Fuccillo Chrysler Jeep Dodge Ram of Nelliston! Whether you're looking to take to the streets in a sleek and stylish Chrysler 200 sedan or a powerful pickup like the new Ram 1500, we've got what you need at Fuccillo Chrysler Jeep Dodge Ram of Nelliston. Enjoy luxury like never before when you buy a new Chrysler 300 sedan or a family-friendly Chrysler Pacifica minivan. Or, you can buy a reliable Jeep Cherokee or Grand Cherokee SUV for off-road journeys. We also have Dodge SUVs for an even wider selection. If you'd prefer a pre-owned Jeep, or another make, we have plenty in stock for you to choose from, too. Keep your vehicle running smoothly with our Ram service department and let the experienced service technicians perform routine oil changes and tire rotations, and even more extensive repairs if you need them. 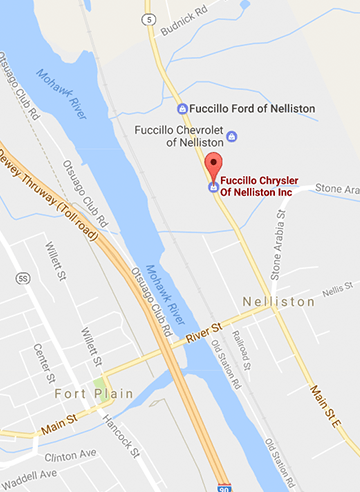 If you're driving from Utica, NY, it's easy to get to Fuccillo Chrysler Jeep Dodge Ram of Nelliston. Simply get onto NY-5S E, then you'll eventually get onto Main St W and you'll be right at our dealership in no time. Come speak with the experts and find the new or pre-owned car you've been eyeing on our lot today!